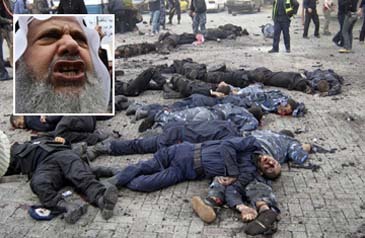 Dubai, UAE (WAM) — How many dead Palestinians will it take for the world to act? Can United Nations Secretary-General Ban Ki-moon tell the families of the 195 innocent people who were massacred by Israel yesterday why he wouldn't even try to protect Palestinians in Gaza the way he does citizens of other countries? Is Palestinian blood cheaper than Myanmarese, American and French or for that matter Israeli blood?, the UAE press asked today in comments about the new Israeli air attacks on Gaza on the eve of the new year. The papers called on the Arab League has to draw the line very clear as the Arab peace initiative is no longer an option. Israel has rejected it anyway. The protection of Palestinians should be the only plan on the table today. "'Maybe these painful questions should be posed to Arab states which have failed to come to the rescue of Gaza. The ravaged, miserable strip had been under siege for more than one year. Its people have been without food and power for many months. And they have not asked for anything more than a sense of human solidarity with their plight," the Gulf News commented. "'And instead of getting the independent state which US President George W. Bush promised to deliver by the end of the year, the Palestinians are today burying their dead. The massacre is Israel's gift to the Palestinians and the Arabs who today celebrate the new Islamic year. For long enough, the paper said, Arabs have been pleading with Israel to embrace peace. Meanwhile, the Jewish state is busy with an election that will see its politicians compete with one another in butchering Palestinians. Kill 100 and you are assured of a seat in the Knesset. Kill 200 and become a minister. "'One really wonders what the Arab foreign ministers are going to say when they meet in Cairo today and tomorrow. Calling on Israel again to 'choose the path of peace'? Appealing to the international community to 'exert pressure' on Israel and the US to revive the peace process? Too little too late. "Today the Arab League has to draw the line very clear. The Arab peace initiative is no longer an option. Israel has rejected it anyway. The protection of Palestinians should be the only plan on the table today. Commenting under the title 'Yet Another Aggression on Gaza"', Khaleej Times said : "'Palestinians are facing another onslaught from Israel. This time the theatre of aggression is the locked down enclave of the Gaza Strip, which has been bombarded by F16 fighter jets killing and injuring at least 180 people. "The air offensive comes amid rumours that a ground operation is imminent threatening a humanitarian crisis as well as prospects of an all-out war. The attack comes on the heels of a crushing blockade of Gaza for months. Around 1.5 million people of this Hamas-ruled enclave are already suffering from food and supplies shortages,"the paper indicated. "'The cessation of a six-month long ceasefire between Israel and Palestinian militant groups last week had raised fears of a showdown across the borders but many believed that restraint would continue. The Israeli onslaught has surprised many because it came within hours of Tel Aviv taking world opinion for a ride by saying that it would open the Gaza border to allow shipment of humanitarian aid. But that has turned out to be a diplomatic stunt to hoodwink the international community,"the paper added. 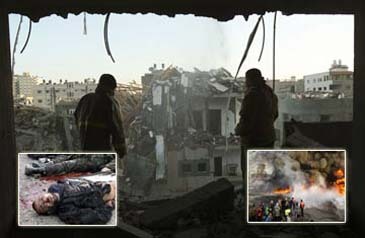 "Though Israel has targeted Gaza in the past as well, the attacks on Saturday were Hamas-specific. The missiles were aimed at security compounds of Hamas across Gaza. And at the same time the action matched vows to topple the Hamas-led government in the enclave. "With Hamas calling for revenge attacks by firing rockets into Israeli territory, a regional catastrophe is in the making. The conflict it seems will not be restricted to Gaza alone. In what appears to be a warning to Hezbollah in Lebanon as well, Israeli jets scrambled from the country's northern air base. The chaotic configuration can easily result in broadening the conflict thus bringing more misery and distress to millions in the region. "A new round of bloodletting in the coastal strip needs to be averted. The world community should go a step ahead than the mere rhetoric of advising restraint. There is no point in condemning Israel. It needs to be tamed. "The attacks have once again proved the vulnerability of neighbouring Arab states to Israeli aggressions as and when desired. "While Gaza waits for yet another Israeli invasion, the need of the hour is unity among Palestinians and also strengthening of Arab ranks. A united Palestinian leadership will be in a much better position to effectively resume the struggle for the two-state solution to which Israel and the United States remain committed. But as an immediate recourse, the aggression should come to an end,"'Khaleej Times concluded.